You never see an animal or bird by chance. 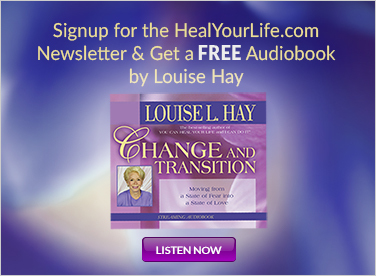 Whether they appear in a book, on television, or in real life, they always have a message for you! It is the same with the Archangel Animal Oracle Cards; whichever card you pick, the animal on that card is wanting to bring something to your attention. All of the cards in this deck are beautifully illustrated and contain spiritual symbols to help you tune in to the energies of each animal. 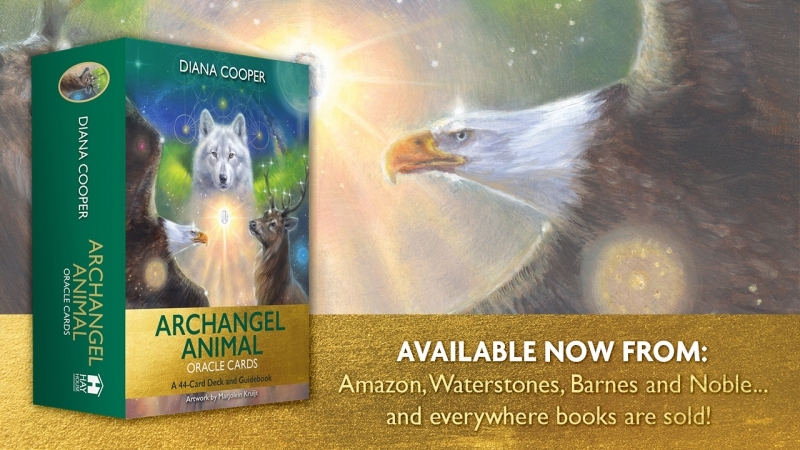 Animals, birds, insects, and sea life are also connected to the Archangels, so when you read about or identify with an animal, their respective Archangel also touches you. Part of the curriculum for ascension is that you must understand and honor the animal kingdom. The cards contain an accompanying booklet which clearly explains each creature’s soul mission and life purpose, and outlines how they can serve or what they can teach you. I feel that using these cards will significantly accelerate your spiritual journey in this lifetime. With many Oracle card decks, I can happily read cards for others but find it difficult to understand the messages for myself. However, with the strikingly painted Archangel Animal Oracle Cards, I’ve found that the guidance is really clear and it’s very easy to read them for myself or others. You can pick a card each morning if you wish to receive a message for the day. Every animal has a soul mission and life purpose. Part of a panda’s mission is to connect you to the Angel Mary. She spreads love and compassion throughout the universes, so when you receive the Panda card you automatically receive a download of heart energy from her. This is one of the reasons why children love pandas so much – even though they may have never seen one! 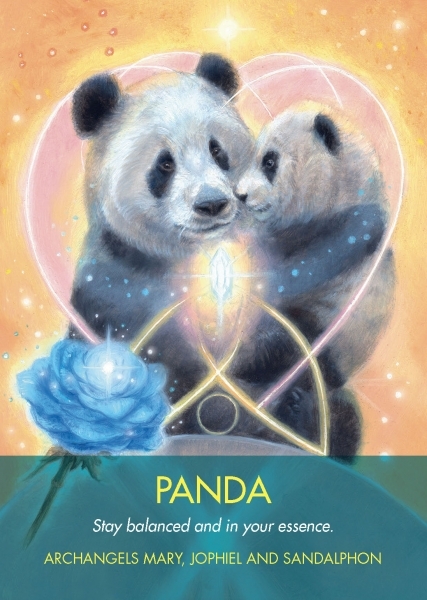 Pandas originate from the Pleiades, and the symbol of the blue healing rose is shown on this card. I particularly love the Hyena card. The message here is: “Dare to be different,” and this really strikes a chord with me. It reminds me that we are all different. It calls on us to rejoice in our uniqueness, for we can bring about change when we are true to ourselves. 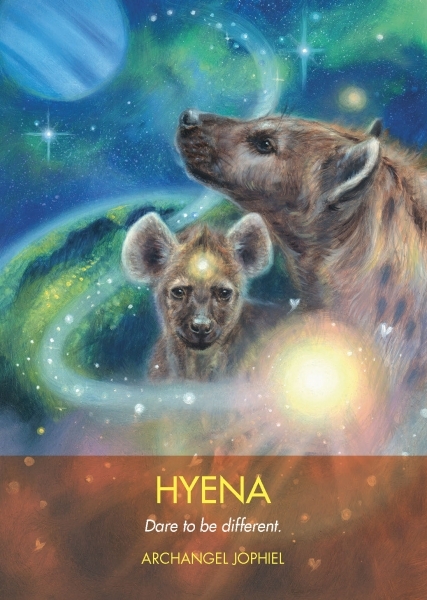 Archangel Jophiel, the Angel of Wisdom, works with hyenas and I can sense his energy whenever I receive this card. Just this morning, I shuffled the deck and chose a card. Out hopped the Rabbit card to tell me to recognize my significance! Wow – that felt important and I heeded it. 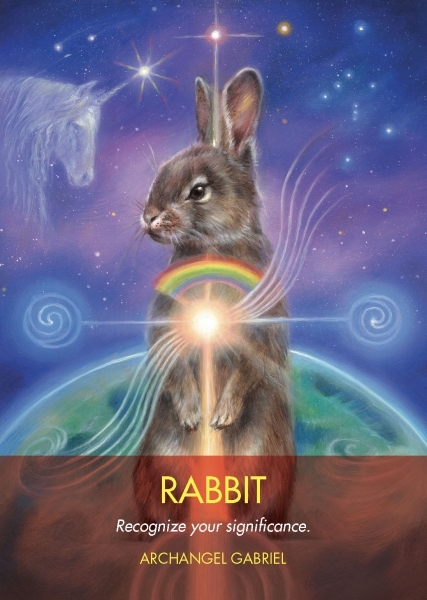 The Rabbit card depicts a rabbit connecting to the Earth with a rainbow over its heart and a unicorn blessing it from above. The warm-hearted rabbits heal hearts with wisdom (as well as love) for they originate from Orion, where the wisdom of this universe is held. They listen to the true notes of Earth and work with Archangel Gabriel to relay the perfect harmonics through their energy fields. The rabbit card guides us to bring ourselves into harmony, for this will help the universe to align itself into perfect divine order. 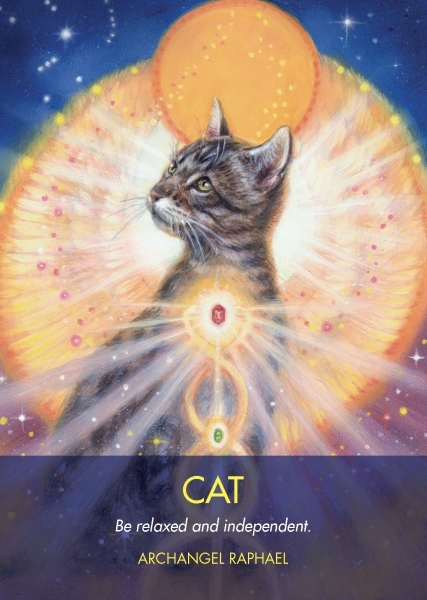 Another card that has come to me several times recently is the Cat card. Few people realize just how powerful our independent little cats are! They are healers, and watch over and protect our homes. 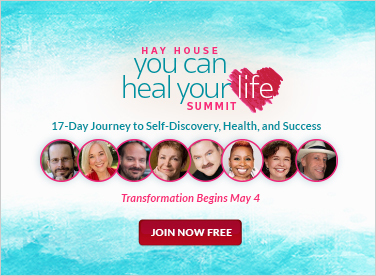 Because they can relax at a deep, core level, they can access pure, spiritual guidance and pass it to you. When felines seem to be snoozing, they are often doing important spiritual work. They are incredibly psychic and this card helps you to connect with Archangel Raphael for healing and to develop your third eye chakra. It also reminds you to relax and be independent.